The PKA-IP-150 (EIP-150) is a family of IP cores designed for full scalability and an optimal performance over gate count ratio. 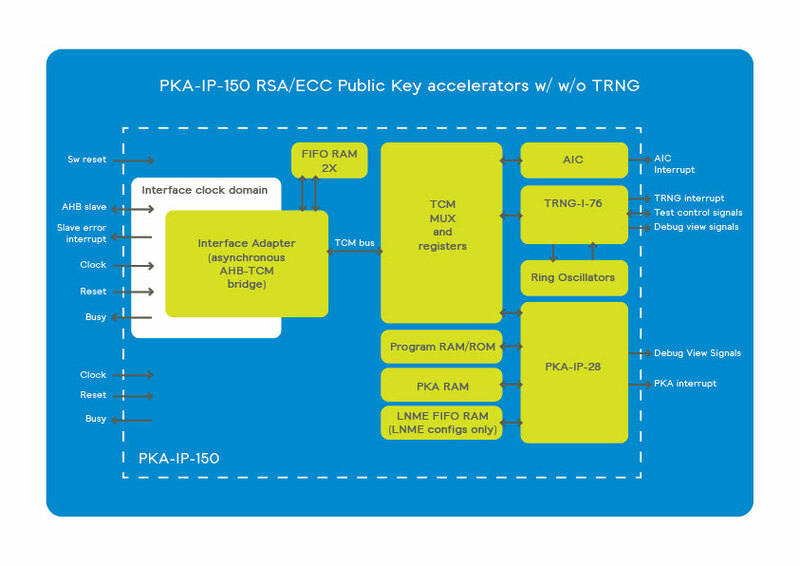 The PKA-IP-150 public key accelerators address the unique needs of semiconductor OEMs and provide a reliable and cost-effective IP solution that is easy to integrate into SoC designs. The PKA-IP-150 can be deployed in any semiconductor design that needs key exchange or key generation at high performance or in low power consumption. The PKA-IP-150 public key accelerators combine the PKA-IP-28, TRNG-IP-76 with an AMBA interface such as AXI or AHB. 9 different performance configurations ranging from 40K to 555K gates designs. Public Key signature generation, verification & key negotiation with little involvement of Host. FIPS-140 approved. The PKA-IP-150 is available in 9 different performance configurations ranging from 40K to 555K gates designs, each providing the full set of TRNG and PKA operations with up to 4160-bit modulus size for modular exponentiations and 768-bit modulus for prime field ECC operations. The PKA-IP-150 is a security conscious design and can be provided with or without protection against side channel attacks. For details please refer to our dedicated PKA-28 and TRNG-76 pages.